The Fench Manufacturer Airomia, real passionates of vape, presents the Le Coq Qui Vape, a brand which will make you discover numerous recipes throughout the range. The Le Coq Qui Vape is of high quality and offers savoury aromas, full of realism. Classic, Fruity or Gourmet, adopt the Coq which suits you. 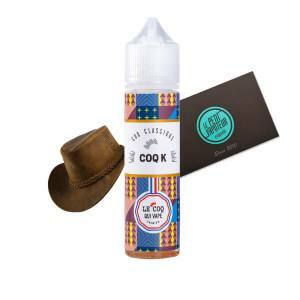 The E Liquid, Le Coq Qui Vape is available in a 50ml bottle conditioned in France by Airomia. It offers a PG/VG rate of 50/50, without Nicotine. You can add one or more nicotine boosters if needed. The Le Coq Qui Vape is composed of unique flavours. You can find the Classic Le Coq as the name indicates, discover beautiful recipes with a Classic Base. These liquids will reminfd you of your childhood with gourmet flavours. To finish the Tutti Fruitti by le Coq will bring you a dose of real fruits.